On October 25, 2016, in response to reports of racial tension and discrimination within Philadelphia’s Lesbian, Gay, Bisexual, Transgender, Queer/Questioning (LGBTQ) population, the Philadelphia Commission on Human Relations (PCHR) held a public hearing. 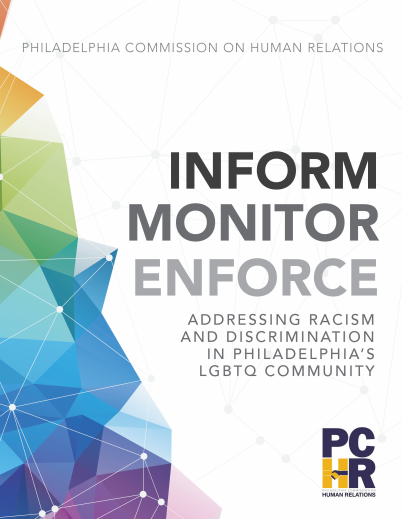 Based on the hearing, the PCHR is issuing this Report on Racism and Discrimination in Philadelphia’s LGBTQ Community to present its findings and offer recommendations. The PCHR’s goal is to ensure focused, actionable steps are taken to bring resolutions to the problems LGBTQ community members raised. Inclusion in the Gayborhood – LGBTQ people of color, women, and transgender people often feel unwelcome and unsafe in Gayborhood spaces. Ongoing issues of racism –Racism and discrimination have been ongoing problems within Philadelphia’s LGBTQ community for decades. Ad hoc policies support discrimination – The business practices of many of the bars in the Gayborhood are the source of numerous reports of racism and discrimination. Questionable employment policies – Current and past employees of certain LGBTQ social service agencies report patterns of discrimination relating to the agencies’ employment practices. The Philadelphia Commission on Human Relations Report on Racism and Discrimination in Philadelphia’s LGBTQ Community sets forth four key recommendations that if implemented will reshape the Gayborhood and non-profits that serve the LGBTQ community. Board members, directors, management and staff of the Mazzoni Center and Philadelphia FIGHT must receive training on the Fair Practices Ordinance and implicit bias. The Independent Business Alliance (IBA), Greater Philadelphia’s LGBT Chamber of Commerce, should create a training that provides leadership development for prospective and/or new board members. Nonprofits that receive city funding to provide services to the LGBTQ community must conform to the non-discrimination provisions of the Fair Practices Ordinance and the Office of Economic Opportunity (OEO) requirements included in their professional service contracts with the City of Philadelphia. Establishing a safe and inclusive community starts with acceptance, awareness, and intentional input from all community stakeholders including government officials, nonprofit leaders, employees, and patrons. The PCHR will provide oversight for the implementation of our recommendations and provide training on the city’s anti-discrimination laws. The PCHR will follow-up and ensure compliance with our recommendations and the law. Failure to comply may result in compensatory and punitive damages, injunctive relief, costs and attorney’s fees.